Newcastle Benfield immediately bounced back after their eight-match unbeaten sequence was ended at the weekend. Although they were flattered by the 5-1 scoreline, Steve Bowey’s side thoroughly deserved to defeat Billingham Synthonia to move into seventh place in the Ebac Northern League First Division. 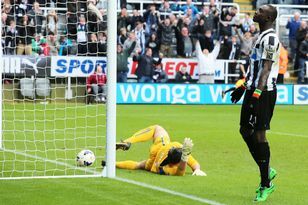 The Tynesiders made a dream start, scoring twice in the opening 23 minutes. After just 11 minutes a Gareth Williams’ cross found Paul Brayson whose bullet header gave Synners’ goalkeeper James Hamilton no chance. James Luccock then set up Brayson who was brought down and he converted the resultant penalty. Although the Teessiders rallied, two goals from Bowey and hat-trick hero Brayson had Benfield well ahead even though Michael Sweet reduced the deficit. In added time Benfield went nap with a fifth goal by Michael Riley. Shildon opened up a three-point lead at the top of the table with a hard-earned victory at Marske United. Lee Paul Scroggins took advantage of a defensive blunder and tapped into an empty net on 16 minutes. Eight minutes later Ben Wood headed home and although Danny Earl cut Marske’s arrears before the hour mark, they were unable to produce an equaliser. In added time Marske goalkeeper Robert Dean was sent off. Despite scoring three times at home, Morpeth Town went down to Consett at Craik Park. Morpeth twice hit back in the opening half through Michael Chilton, with a brace, after Michael Mackay and Anthony Lund had struck for the Steelmen. Luke Sullivan restored the advantage to Consett only for Shaun Taylor to level and at 3-3 it was anyone’s game but Consett emerged 5-3 winners with late strikes by Calvin Smith and Sullivan. Hebburn Town remain bottom of the table after losing at Crook Town where Callum Smith gave them a first-half lead. Craig Hughes restored parity and Kyle Davis fired Crook in front on 69 minutes but it wasn’t until late in the game that Hebburn’s hopes ended as Davis scored again. North Shields romped to a 5-0 victory at Brandon United to consolidate fourth place in Division Two. Their man of the match was Daniel Smart who rifled four goals with Keiran Wrightson also on target for the Robins. Heaton Stannington extended their lead at the top to four points with a 5-2 victory at Esh Winning where a powerful second-half performance was rewarded with goals by Kevin Carr, Daryl Clay and Jonathan Wright. Wright was an early marksman for the Stann and Brian Dodsworth made it two but Esh hit back with goals from Paul Richardson and Anthony Ward before Heaton took control after the break.